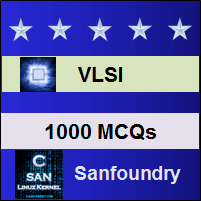 This set of VLSI Multiple Choice Questions & Answers (MCQs) focuses on “Device Modelling and Performance Estimation -1”. Explanation: MESFETs are channel area modulation devices and they depend upon the capacitance of thee schottky barrier. Explanation: Gallium arsenide devices have three regions of operation – cutoff, linear and saturation. Explanation: The current Ids results due to the flow of electrons, the majority carrier from source to drain. Ids can be given as ratio of charge induced in channel to electron transit time. Explanation: The transit time is given as the ratio of channel length to velocity and the carrier velocity can be further given as product of electric field and electron mobility. Explanation: The average potential difference between the gate and the channel (Vgb) owing to the shape of the depletion layer can be given as 0.5(Vgs-Vt). Explanation: The average electric field is indirectly proportional to implant depth and this electric field can be given as (Vgs-Vt)/a. Explanation: β is a common parameter used in MESFET and it is denoted by kp. Kp is in the order of 0.1 to 0.5 mA/V2. Explanation: The hyperbolic tangent function tanh(aVds) is used to decribe the channel conductance at low drain to source voltage Vds. Explanation: When the gate to source voltage Vgs increases, the magnitude of the depletion region beneath the gate decreases. Explanation: When Vgs < Vt the increase in drain to source voltage above the saturation voltage leads to current saturation. Explanation: The saturation of drain current with increasing drain to source voltage is caused by velocity saturation which occurs in high electric field in the channel. Explanation: The boundary between the linear and saturation regions defined by Vds=Vgs-Vt is referred to as the ‘knee voltage’.